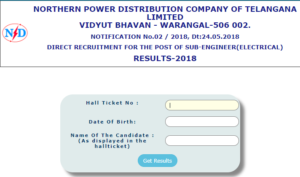 Telangana State Northern Power Distribution Company Limited conducted the examination for direct recruitment to the posts of Sub Engineer on 8th July. And now, TSNPDCL Sub Engineer result 2018 has been declared online. Candidates appeared for the examination can check out their scores through tsnpdcl.cgg.gov.in. Hall ticket number, date of birth and name of the candidate are required necessarily to figure out the scores. Notification for a total of 497 vacancies was issued on 24th May 2018. According to that notification, all the eligible candidates had to submit their applications from 18th June. On the official website, the had provided the rejected candidates’ list. As per the selection procedure, the only written examination was to be conducted and there will be no interview. Only document verification process would be organised and only those candidates will have to appear for it who have qualified the written examination by being ranked high. 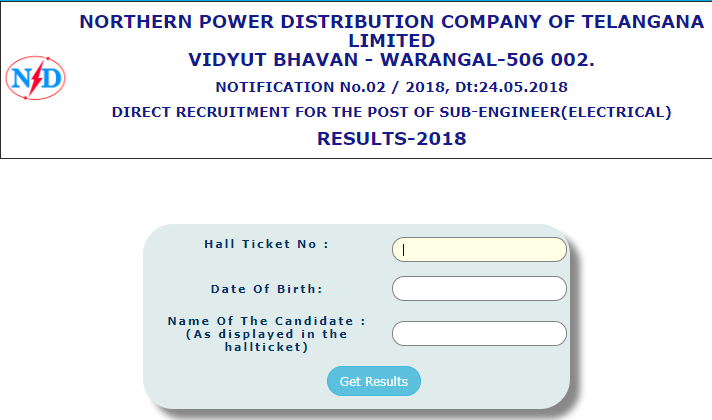 The Corporation has made the TSNPDCL Sub Engineer result 2018 available online only, thus, candidates should have to visit the official website first. The web address for the same is tsnpdcl.cgg.gov.in. When it opens, exam dates, starting and the last date of application form and result links of respective posts have been provided in the columns. In the third row, candidates would get details concerning the Sub Engineer posts. In the last column of that row, the link for the recently uploaded result is given. Hitting that link will head aspirants to another page. On that page, contenders have to enter their hall ticket number, date of birth and name (as provided in the hall ticket). After filling all of these credentials correctly, candidates would be able to figure out their scores. Candidates would be appointed to the Circle/ Sub Stations as per their ranks in the merit list and as per preference for allotment of non-local candidates against the vacancies.